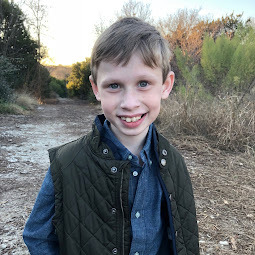 Thanks to a sweet commenter on the blog who asked for an update on "how Bennett's doing with his eating," I thought I'd update Bennett's eating progress on the blog. In fact, I went back to see how long it's been since I've written about his eating: it's been almost exactly a year! I find I don't write as much when things are going well. 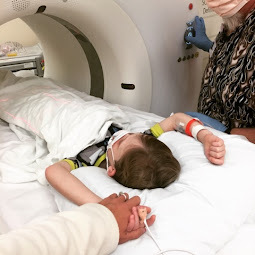 So...how's our little guy doing? Bennett is doing great!! 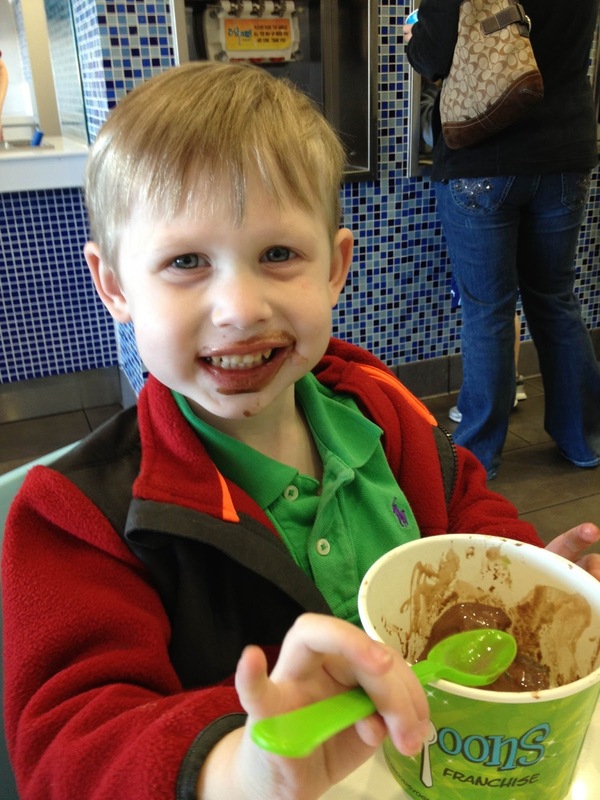 Bennett has a long list of favorite foods these days, one of which is chocolate frozen yogurt with M&Ms and gummi bears from his favorite place, 3Spoons. To our delight, Bennett has become a very regular eater. He tends to prefer to eat a handful of foods regularly but is definitely adding to his list over time. We just let him decide what he likes and we let him eat as much as of it as he wants. We sorta trust that, like most children, he will expand his repertoire of foods as he gets older. For breakfast these days, Bennett prefers a Poptart, mini donuts or sweet cereals. In typical toddler fashion, Bennett asks that we take "crust" or "the white part" off the Poptart each morning, which we do. But we know that if we give him time, he'll learn to like to eat that too. For a long time, Bennett preferred to eat a turkey Lunchable for lunch every day. 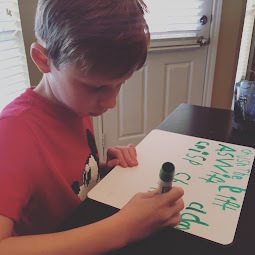 We tried to substitute and introduce new lunch options but he was adamant that he all he wanted to eat was a turkey and cheese Lunchable with crackers (he simply would go on strike at lunch time when he gave him something else to enjoy). Fortunately, he eventually tired of daily turkey Lunchables and has since begun to eat hot dogs and peanut butter sandwiches for lunch as well. He loves grapes, strawberries, apples (sometimes) and, most recently, bananas. He won't pass up a cookie, chips or candy. He has a huge sweet tooth and a profound love for chocolate. This may be because we allowed him to eat as much candy as he wanted for a very long time. Up until now, it has been more important that Bennett eat something rather than nothing, particularly if that something is high in fat and calories. I worried for a long time if this was a good decision - to offer and encourage so many sweet items. But, looking back, we see that it has been very good for him. While Bennett has naturally developed a sweet tooth, his interest in all types of food has increased and now we can use his love for sweets as a reward for consuming more food or trying completely new foods - something we couldn't do for the longest time because he found no foods appealing. The nice thing about dinner time is it's an opportunity to encourage Bennett to try new foods. We focus less on calories at this point in the day and more on textures and new tastes. He has done an excellent job learning to eat tiny pieces of chicken, steak, pasta, beans, vegetables and bread. His favorite dinner meal at this point is chicken, rice, peas and corn. He really enjoys participating in the process of eating, such as placing butter on his rice or pouring salt and pepper in his food. I have been proud of him for enjoying ketchup. These are all acquired tastes that have no necessarily been natural for Bennett. "So, looking back, what seemed to help Bennett the most?" This is the question I regularly ask myself. Was it early speech therapy intervention or our time at the Baylor Feeding Clinic almost two years ago? Was it simply maturity and his exposure to food, learning to tolerate new tastes and foods in his mouth? Maybe it was going to school and seeing his friends successfully eat every day? Or could it be having his eight back teeth capped, potentially addressing undiagnosed cavities? I am not sure if I could point to one specific thing. I think every one of those things helped significantly at some point. While I will say the single greatest improvement with his eating issues came from our time at Baylor, we have seen important additional benefits of maturing and eating with his peers at school. Having his teeth fixed during dental surgery last December may have been the cherry on top. It wasn't the greatest improvement but it seems that Bennett's consistency with eating and most definitely his willingness to eat larger portions of food has increased since that period. All in all, Bennett's eating issues are slowly becoming not issues at all. Maybe the one thing that demonstrated this to me most clearly was recently when he learned to swallow his enzyme pills. What an amazing feat for a child with a history of oral aversion? We have no plans to stop using his nightly feeding tube. We won't be removing his feeding tube at any point in the near future. Bennett continues to get about 500ml of 30-calorie formula per night, an amount that has not been adjusted since he was 18 months. 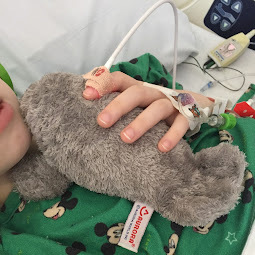 We consider his feeding tube feed supplement and hope it will continue to give us the peace of mind that we don't have to stress over his eating choices, he'll get the calories one way or the other.